A Celebration of Peace Through Music is a concert celebration of music and spirit, open to people of all faiths. 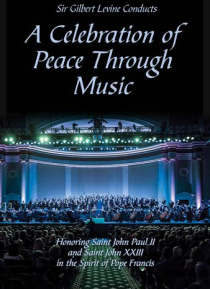 Conducted by Sir Gilbert Levine, the concert honors the canonizations of Pope John Paul II and Pope John XXIII, in the spirit of Pope Francis. Each musical work performed was selected to reflect the spirit of these three great spiritual leaders and their commitment to peace and brotherh… ood among people of all faiths.